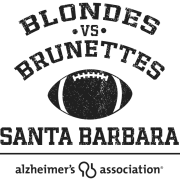 We invite you to join us for Santa Barbara Blondes vs Brunettes (BvB) on July 20th. BvB is a volunteer-driven fundraiser benefiting the California Central Coast Alzheimer's Association in Santa Barbara. This event is centered around flag football and players are young professional women in the Santa Barbara area. Two teams battle it out on the field and in fundraising efforts to support the organization with help from the local community. Since 2012 Santa Barbara BvB has raised over $450,000. Volunteer opportunities include being a ambassador, player, event planning, virtually doing tasks from home, event day help only, and many other roles. Please reach out to Katelyn at 805-892-4259 ex 103 or kreeves@alz.org. Learn more about BvB and register at act.alz.org/bvbsb.